My tone stung the sweet ones. Swept by a tidal wave of irritation in the face of disobedience, I felt myself drowning in anger. Exhaustion hung on every cell of my body. All I could think about was how I wanted this moment to be over so I could rest my weary bones and forget about this day. I had abandoned all desire of an elegant and responsible exit, now I just wanted out. Emotions washed over me as I gazed at their little faces, blood rushing into mine and ready to send them off to bed so we could start fresh in the morning. Then, I felt it; a hand pulling me up out of those rushing waters, swiftly through those wild waves of emotion. Air filled my lungs and my blood flowed freely for the first time in moments. I exhaled. We prayed. My flesh was raw and vulnerable; my eyes back where they belonged. This mothering thing is so much harder than I imagined. It stares in the face of sin and threatens to awaken the enemy’s temptation on my soul to give into my own. I fear I will fail. Fail myself. Fail them. Fail my husband. Fail God. I fear that the seeds will fall on drudged up soil and none will take root. It weighs heavy on my heart at times, in the still of the night after hard days. I want to run for the hills or maybe just hide under the covers for a day or two. Sometimes, it just feels like a lot. In the face of impossible moments I stand firm and tall and strong on other days. No tone or defiance can break me down. No crazy schedule can send me screaming at them or to those hills. Sometimes I mix the yeast and water and wait. I mix in the ingredients and kneed. I form a ball and let it rise and shape it and wait some more. I patiently linger with my eyes on the fresh baked bread that will bring warmth to our table. I see it before hand. No need to rush out and buy a loaf when the dough seems too sticky. It will pull away from the sides with time and perhaps some extra flour sprinkles. No need to call for reservations when the loaf seems too small. It will rise and feed us all. In time, it will all come together as long as I keep faithfully moving forward, working and waiting for that final loaf. Peter wanted to walk to Jesus, to walk on the water in faith. And, he did. He stepped out in faith and authentically moved forward. As long as his eyes were firmly focused on the Lord, He walked seamlessly across those lake waters. In the face of the wind, He lost sight of where he was headed and began to sink. He took his eyes off of Jesus, the Savior, and focused on the storm. Crying out to the Lord, he felt His hand pull him out of the waters that washed over his unbelief. I imagined mothering in the innocence of baby cuddles and toddler giggles, of game nights and new experiences. My mind never truly entertained the depths of enveloped and conflicted emotions this role would bring, although my heart knew there would be hard times. Sticky moments that needed sprinkling and time to pull away. I wasn’t prepared for the strength of the current. I longed for it so deeply though, before I even knew if my womb would carry. 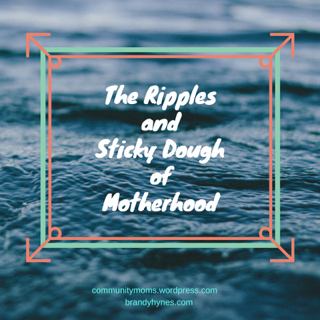 I cried out in faith, not long after I gave my life to Christ, begging to walk on the rippling waters of motherhood. And here I am. Like Peter, when my eyes remember to focus on my Savior, I walk clearly in His direction. I walk in faith. I glide through the storm on top of those deep, scary waters. Skim boarding on the waves that come my way, I ride them in knowing that no matter how large or rough they may be, Jesus is my focus. But, when my eyes turn to look at the wind, the storm, or the height of the waves to come, I fall. I fail in my flesh. I sink and the waters rush over me until I cry out to Him again. Even with our eyes firmly planted in His direction, this journey of mothering, of life, is hard. Each step is a step of faith, a step that feels new and scary and never done before. We put one foot in front of the other and walk towards Jesus on these intense waves. But, our flesh will fail. Our eyes will look away. Our tone will sting and our sin nature will rise. But, Jesus always lifts us out of those sinking waters when we call out for help. Our Savior always wins over sin. His promises reign. I set the table for dinner the next day. My soul cleansed by emerging from the waters that had weighed on me. I see more clearly now, more focused. We talk about lessons learned. We lean into one another, knowing how fragile we all are. Knowing how sin overwhelms us and threatens to separate us all. Together, we break the bread that we so patiently waited to rise. Or connect with Brandy on Facebook or Twitter. Beautiful post, Brandy! I truly don’t know how anyone weathers the storms that motherhood throws our way without Jesus. As a 30 year weekly bread baking veteran I really enjoyed your analogy! I love your post, Brandy. So open and real. 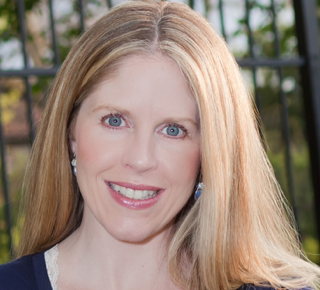 I didn’t have a firm faith in Jesus while mothering my kids. But He certainly was watching out for me. We weathered the storm. I agree, Wendy! I am so grateful for my faith, especially in the storms of mothering. I love to bake bread. I’m sure I could learn a lot from all your years of experience, both with the bread and raising a large family. You are inspiring! Thank you so much Janis! God was watching out for you and clearly had great plans for your life. Your writing and teaching are surely a shelter for many who find themselves in a storm.